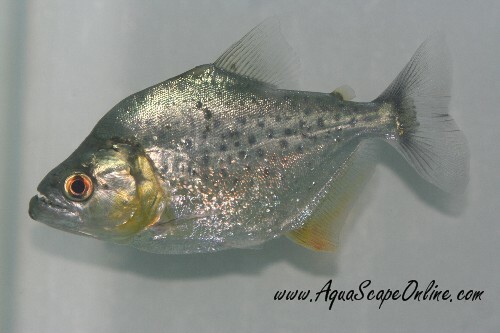 The Gold Diamond Piranha is very similar to the Black Piranha, the only difference is the Diamond's body has large silver scales on it, It almost looks like some one sprinkled gliter all over its body. The body is also higher (Diamond shaped) hence giving the name Diamond. They grow as big as the regular black 16" and have the same temperment. NOTE. Gold Diamonds must be kept in thier own tank due to their super aggressive nature. They make a beautiful show specimen. It is a beautiful site to see the light reflect off their Yellow body when they are swimming in a well lit tank.